Sunday, Day 1: Welcome aboard! In the afternoon, you will be met by a crew member of the Rendez-Vous at the designated meeting point in either Paris, Dijon or Geneva. From here, relax as you are chauffeured to Rendez-Vous, moored in the village of Vandenesse-en-Auxois. A traditional champagne welcome and introduction to the crew awaits you, before your first gourmet dinner aboard. This morning the barge will begin her gentle journey along the canal. Guests can bicycle at their leisure, or simply laze on deck and admire the countryside vistas glide by. In the afternoon, guests can bicycle approximately 20 miles to Chateau de Chassagne-Montrachet for an introduction to locally produced wines and of course a tasting. Return to the barge for cocktails and dinner. Once again, a customized ride through the bucolic vistas await while the barge cruises. Upon mooring, your Tour Guide introduces Châteauneuf-en-Auxois, a hilltop village perched overlooking the canal. Châteauneuf's imposing position reflects its history as a 15th century fortress. A tour of the Chateau reveals architectural details and timeworn relics of the period. Tonight, enjoy an evening stroll as Chef prepares dinner. 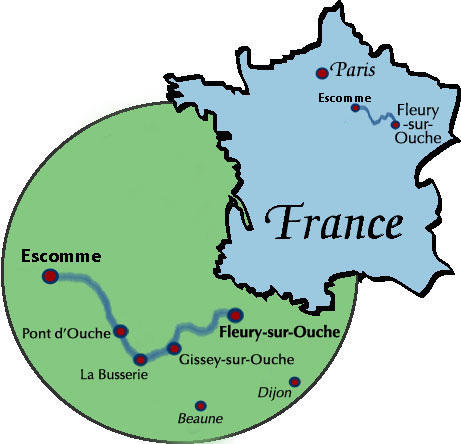 The choice is yours: bicycle to Beaune, a 20-mile route, or ride with our vehicle. Upon arrival, your Tour Guide introduces Hospice de Beaune, an immaculately preserved medieval hospital in use until the early 20th century. Enjoy lunch at a lively local bistro, and then tour and taste at the last family-owned mustard factory in Beaune. Browse the town's boutiques before returning to the barge for drinks and dinner. As Rendez-Vous cruises this morning, meander through the rustic countryside by bicycle or on foot. This afternoon it's a once-in-a-lifetime cycling tour along the Côte de Nuits wine route. Visit Clos de Vougeot, where medieval monks once pressed freshly harvested grapes into the rich vintages still prized today. After winetasting, bicycle back to Rendez-Vous (or catch a ride with our vehicle) for cocktails and dinner. This morning guests bicycle to the vibrant town of Dijon via a lovely 17-mile route. Your Tour Guide will take you to the covered "Les Halles" market, where seasonal produce, artisan cheese, and handmade pastries are beautifully displayed. Ride back to the barge for your final cruise. Explore the towpath or villages, or just absorb the passing countryside. The Captain's Dinner ends your bicycling adventure in style! After breakfast, you will be chauffeured to the designated drop off point in either Paris, Dijon or Geneva. The services of the Barging and Bicycling Adventure include semi-customized cycling routes; detailed route maps; GPS devices; and the phone numbers to the crew. A barge vehicle can follow the bicyclers for assistance. Bikes aboard the Rendez-Vous are VTC Original 520 gris blue b'twin, 21 gears; the vessel carries three 26-inch frame bikes and three 28-inch frame bikes. For riders desiring more advanced bicycles, a rental may be arranged at the expense of the guest. This is a sample itinerary which may be subject to change depending on local conditions.